School starts again tomorrow so I won't be able to post as often anymore ㅠㅠ However, it's the first day of December! :D And with that, the countdown to Christmas begins. With Christmas coming up, plenty of brands have been releasing holiday collections. 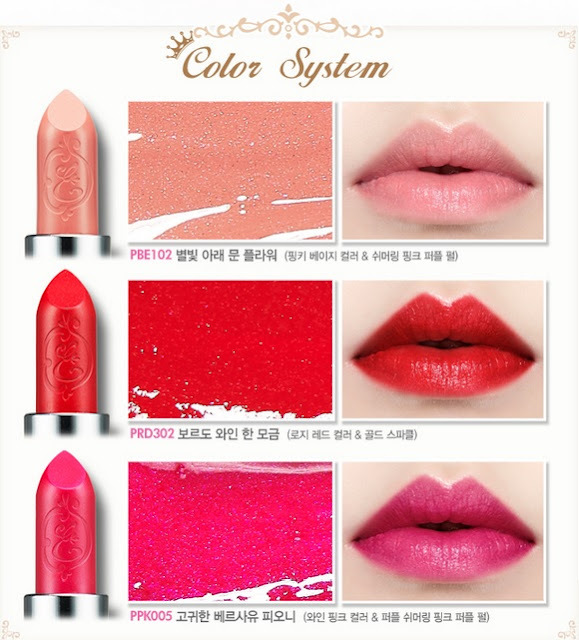 I'm not sure if Etude House is done releasing new products for the year, but it sure looks like it. 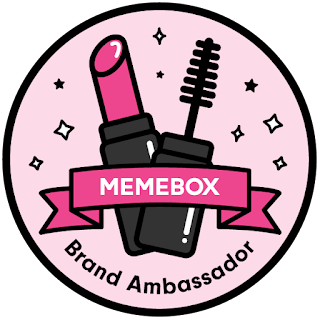 Let's look at their newest products. 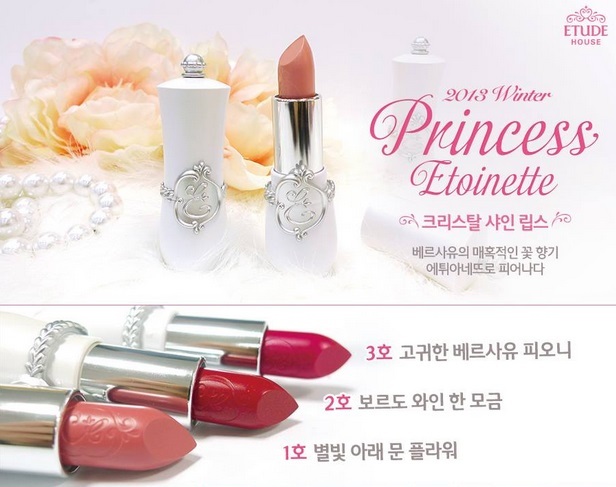 First things first: the highly anticipated Princess Etoinette 2013 Winter collection. 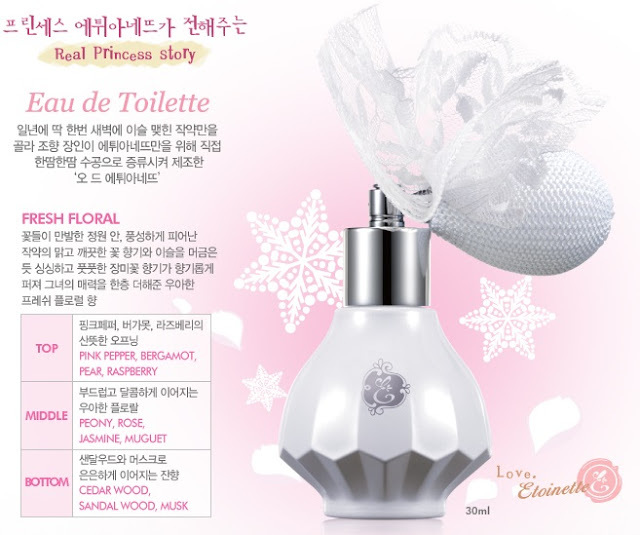 It seems like the highlight of this year's collection is the Princess Etoinette Eau de Toilette, and I can see why. The perfume bottle is very elegant, pretty, and on top of it all, girly. Just look at it! Retailing for 25,000원, Etude House is selling this along with he Princess Etoinette Mirror, with retails for 5,000원. 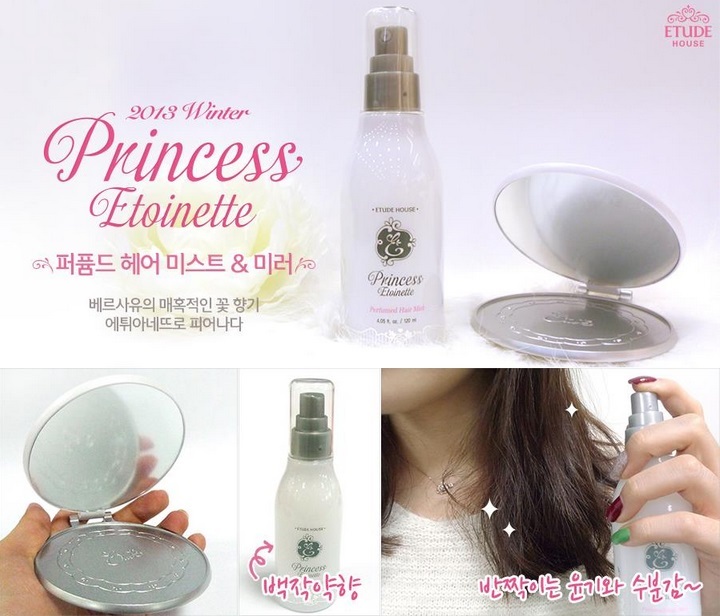 The most expensive product, however, is the Princess Etoinette All Over Powder, retailing for 30,000원 (you also receive the mirror when you buy this product). 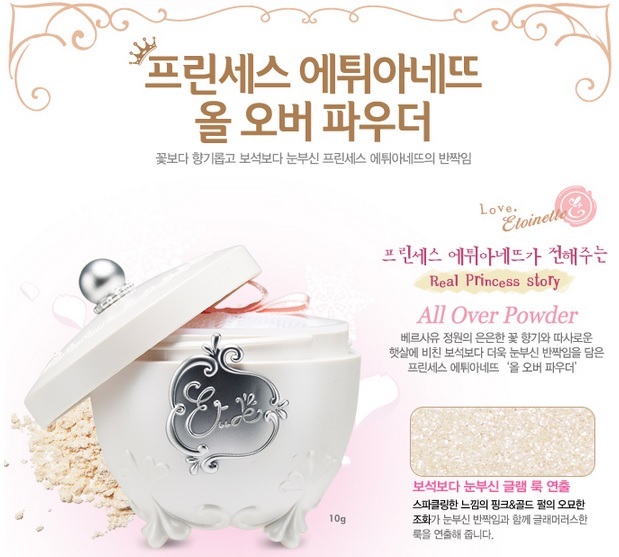 As the name suggests, you can use this powder anywhere. On your face, body, eyes, and even your lips! 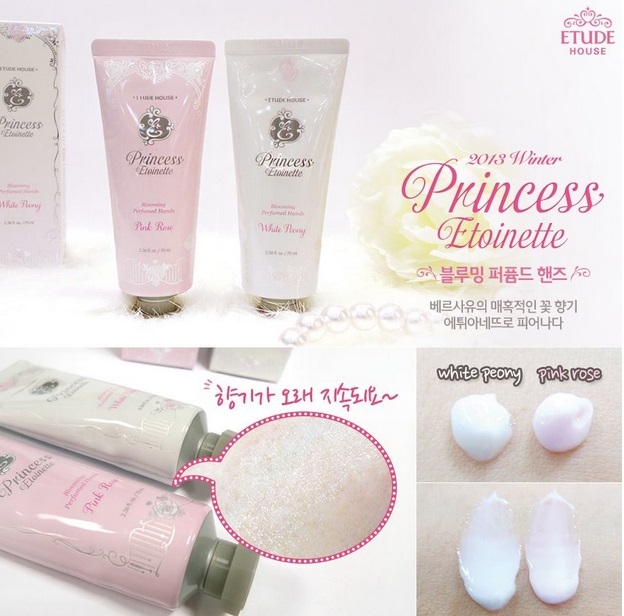 As the weather gets colder, all the brands seem to be releasing hand creams, and Etude House did as well in this collection, the Princess Etoinette Blooming Perfumed Hands, in two scents: White Peony and Pink Rose. 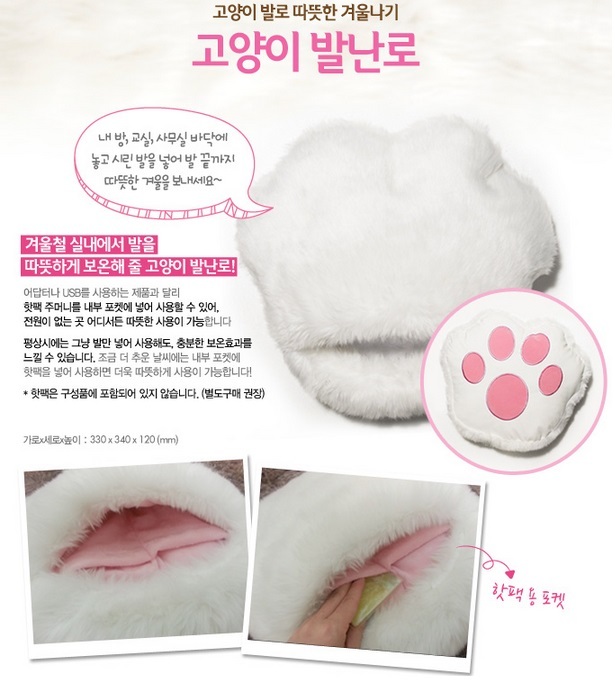 These are retailing for 8,000원 each. Is it just me or are candles a big thing this year? 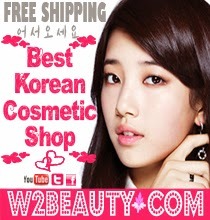 Or maybe that's just for Innisfree and Etude. 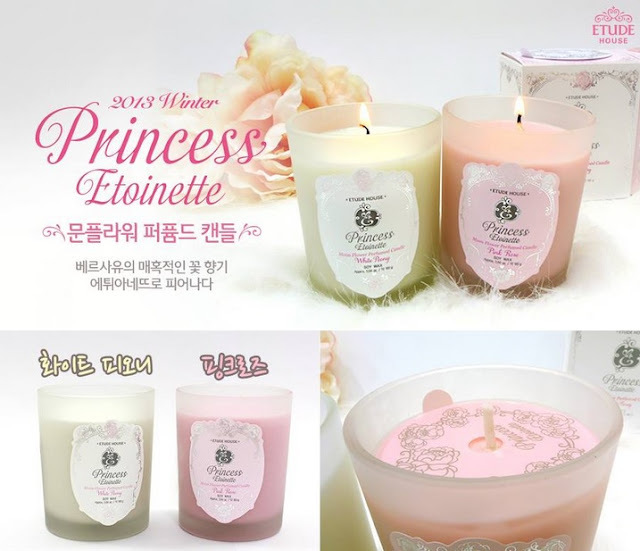 The Princess Etoinette Moon Flower Perfumed Candle (11,000원 each) also have the same scents as the hand creams, White Peony and Pink Rose. And that, is the whole Princess Etoinette Winter 2013 collection. 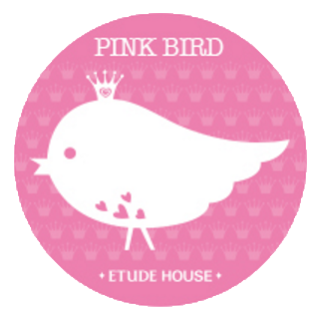 On the same day this collection was released, Etude House also revealed two more products. 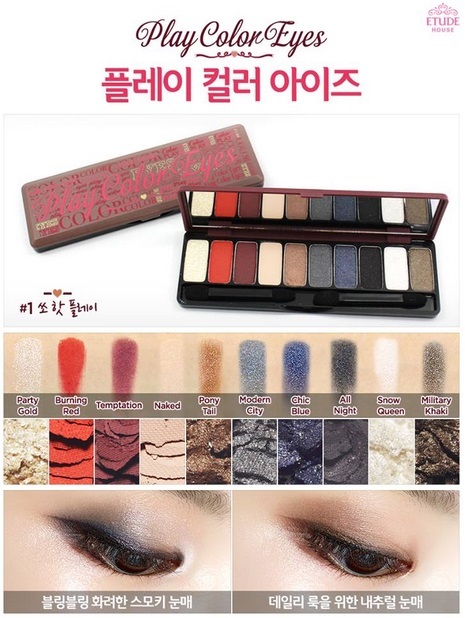 How many people missed out on the Rose Flowering Eyes Palette? If you did, no worries. 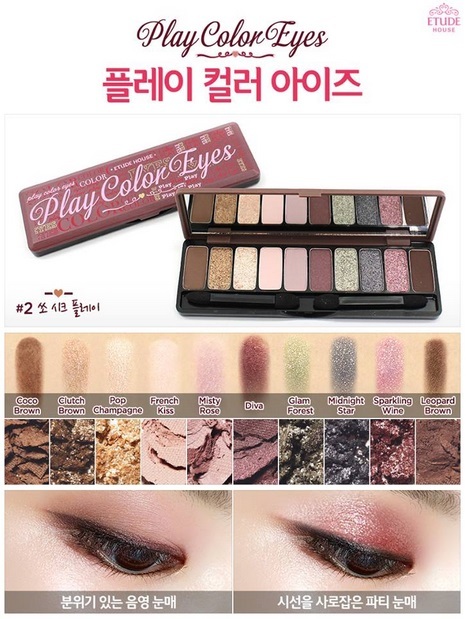 Etude House now has a limited edition Play Color Eyes Palette for you guys instead, and there's 2 types. Both retail for 22,000원. 1호 쏘 핫 플레이 (So Hot Play) has some interesting colors, such as Burning Red. I don't know about you, but this seems like a good dupe for the new Urban Decay Naked 3 Palette for those who can't afford it, although that might just be me..? Heh. Along with the new cosmetics, Etude House also released a (un)common household object. 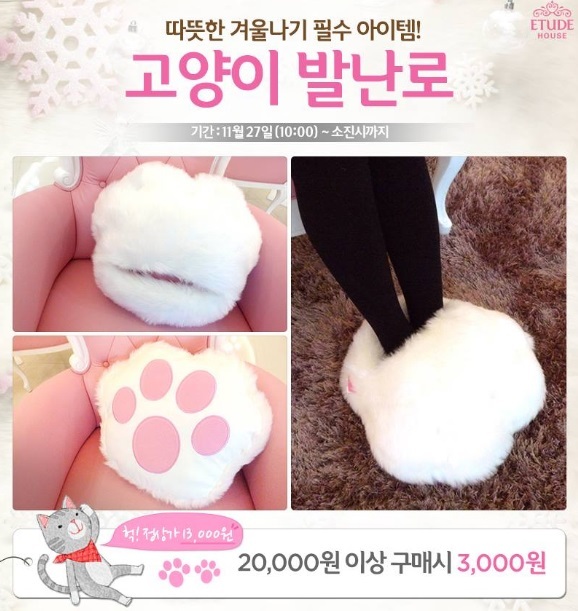 For 13,000원, you can get this adorable feet warmer, the Cat Paw Stove! This is perfect for winter. ^^ I can just sit in front of my laptop with this and a cup of hot chocolate, watching Running Man... okay I'm getting off topic. So how many of you are planning to purchase any of these? 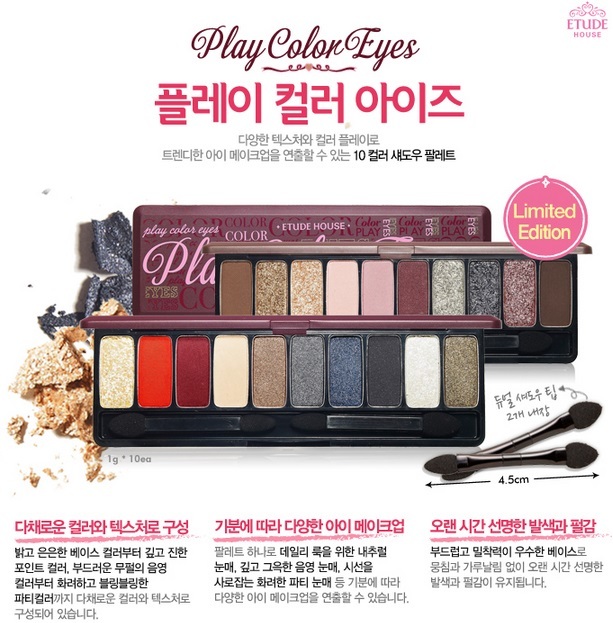 I've already picked up the Cat Paw Stove and while the Play Color Eye Palette #2 is a huge temptation, I can't because I have plenty of Clinique eye shadows with similar colors, and my wallet is really hurting now after my recent haul (so expect a post on that in 2 weeks!). You can buy ALL of these at W2Beauty. Alice has a discount for e that will last to at least Tuesday morning. Just enter W2SALES10 at checkout to receive 10% off your order :) First time buyers can receive a $5 voucher by entering the code 04308009 at registration. What are you waiting for? Go get these while you still can!